If you want to add some pearls to your cupcakes for that extra bit of decorative flair, but you don’t like the hardness of regular sugar pearls, we urge you to consider our crisp pearls. These are beautiful and flavorful balls of pearly crispness that would be a great addition to nearly any cupcake or cake. Instead of a sugar center, these pearls have a crisped rice interior which gives them a gentle crunch, adding texture to your treat. While these extraordinary beauties don’t come in all the colors of the regular sugar pearls, they do complement most any color scheme, and they come in a few flavors. On the cupcake at the top of this page is the Dark, Milk, and White Chocolate Mix; at the very left is the Sea Salt Caramel flavor; next to that is the White Chocolate Crispy Pearl; you can tell the Orange Pearls and the Strawberry Pearls by their colors; and our most colorful crispy pearls are in the Rainbow Assortment. 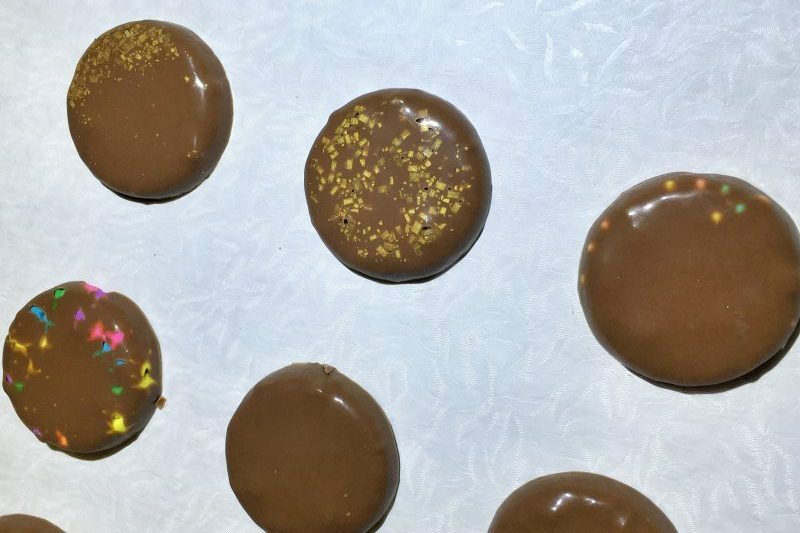 We also carry (but they’re not shown) Gold Chocolate and Silver Chocolate pearls. These are chocolate pearls accented with gold and silver. They’d be a sophisticated addition to any treat. Consider these simple and flavorful additions to your treats next time you decorate. Category:Food Products,Problem Solving “Tylose” has undergone a bit of a name change. It’s now called “CMC.” They are exactly the same thing, but CMC is merely an abbreviation of the chemical composition of the powder. Tylose powder is one of our newer products. Some of our customers know how to use it already, but for those who don’t, here’s what you can do. You can use tylose by adding it to fondant to add strength to it so it dries hard like gum paste. This means that you can mold your fondant into delightful little sculptures that won’t sag! It won’t make fondant taste any better, but that’s another story. You can also make a transparent edible glue using fondant and water to glue your little sculpture pieces together. If you start by sculpting a fondant piece using a small amount of fondant, you can add Tylose in small amounts while kneading it. Just add a pinch of Tylose here and there – kneading all the while – until the fondant starts to become more firm, but not stiff or crumbly. Start small. You can then complete molding or cutting your figures or decorations as you normally would. Let dry for a couple of hours or until the decorations are stiff. That’s all there is to it. You’ll now have non-saggy decorations. If you need to mix a larger quantity of fondant then add 1 – 3 teaspoons of Tylose powder per 1 lb. of fondant. The amount you’ll add will vary depending on the humidity. The more humid it is, the more Tylose you’ll add.